Warrant are still alive and rockin. Hey, I' m really glad, 'cause I really like these guys !!!!!! Do you remember songs like Dirty Rotten Filthy Stinking Rich, Heaven, Sometimes She Cries, Cherry Pie or 32 Pennies ??? 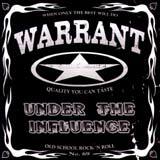 Yes it's all from Warrant, it tastes good and it's refreshing (it's written on the cover: quality you can taste)... The band was pretty big in the USA with their first albums D.R.F.S.R. in 1988 and Cherry Pie in 1990. They rock as bands like Mötley Crüe, Ratt, Poison or L.A. Guns. The lineup has changed a bit since the 80's: Jani Lane, Erik Turner and Jerry Dixon are still there and you have Mike Fasano and Billy Morris as new members. It looks like the spirit from the start is still there. Old school Rock'n' Roll this is what it is about. By the way Under The Influence is also a title from a Status Quo album. I am only telling you this, because you got in this CD covers from old timers like Aerosmith, Thin Lizzy, Nazareth, Queen, Cheap Trick, AC/DC and the Beatles. Only good stuff from the 70's and 80's I used to listen to when I was a kid. At last but not at least: there are two great new Warrant studio tracks which are so damn pretty good (should be against the law)... By the way as a big Warrant fan I was sure that Jani was a fan from Phil Lynott (rip) from Thin Lizzy and of course from the Beatles : Penny Lane and Jani Lane are pretty close, no ??? I remember Warrant also covering We Will Rock You (Queen) which was quite a thing. Great bands covered by a great band: a big thank you. Warrant rules..